“I never knew you could become fat like that.” Yes, this is a direct quote, and from one of my good friends, and a man none the less. But people are happy that I am now fat. At least that’s what they tell me. One of my friends even tried to stop me from walking, for fear that maybe I was walking for exercise to reduce the body size. I told her I enjoyed walking from place to place and reassured her I would do my best not to exercise too much and lose all these fats I gained in America. Ha. I am definitely not in america any more. It’s funny the way cultures are often so different and at many times quite opposite. Like take for instant being overweight. Here they were worried about me because I was looking too thin before I left and now that i’ve come back, and i think i’ve gained like 5-10lbs being in the states, they now say I’m healthy. Here being what they call fat, what we might call overweight, shows that you have enough, you are happy in life and you are not in need, which is what most people struggle to attain. So while American’s are busy paying millions at the gym and other methods of reducing weight, most Ugandans are doing their level best to increase. Another funny opposite is skin color. Most american brides will go tanning before their wedding, and millions of people will lay out in the sun and “bake” (as Ruudy likes to call it) in an effort to become darker. And yet from here a bride is actually hidden away for days before the wedding so that she becomes lighter. And telling someone they are brown rather than black is a compliment. Everyone is looking for ways to get lighter and stay out of the sun. Most ugandans will compare their skin color with others saying, at least I’m not as dark as so and so. Always looking for someone to be lighter than. Culture has so much influence on the way we see things and our expectations and beliefs. And too often defines our “normal”. And we have been rescued from from the domain of darkness and transferred to the kingdom of God’s beloved Son, Jesus (Col 1:13). As christians we live in a different kingdom, which means we live according to a different set of rules and in a different culture, a different normal. So no matter what culture we live in on this earth, we should not allow that culture define our “normal”. After several months in America I really realize that I am also somehow a foreigner there, and because of my skin color among other reasons I will always be a foreigner here. And because Ruudy and I come from such different cultures our home will never be completely american or ugandan. God is really teaching us about finding our home in Him, and allowing Him to define our “normal” and allowing His kingdom to define our culture. Whether you are white or black (or brown), or fat or skinny, or whatever, you don’t have to live feeling you are out of place or you don’t fit in because, in the kingdom of God, He delights in His children and each child is celebrated, you are celebrated. His “normal” is unconditional love and that’s the kind of normal we try to live in. Knowing His unconditional love and giving it out. Let’s let God’s kingdom culture define our normal. A stranger in my own Country! I have heard people talk about being culture-shocked when they returned to their own countries after being away for a while but i didn't know what that meant; somethings are better experienced first hand. As most of you already know, i am ready to return back home and couldn't wait to be back; in fact sometimes i felt like the plane was being slow. We briefly got delayed in London and this was not going down well with me, i did not want my dear friend to wait for us longer than he was expecting at the airport since we were arriving late. Finally we touched down at Entebbe and we were all happy to have made it. However, the moment i stepped out of the plane, things started changing. When we left Michigan, i had almost three layers of clothing (these included a heavy sweater and a winter coat!). It felt normal in London to have these layers but now hear, i couldn't bear the heat! I was profusely sweating one could even wonder whether i was a nervous drug smuggler or terrorist! Entebbe is supposed to be one of the cool places in Uganda but it felt like desert. The layers had to come off one after the other. After an hour's drive, we arrived at our friend's house. Even though it was a few minutes to 1am, his wife still had food for us which she warmed up and served (bless her); she had prepared chicken and boiled potatoes. The food was so delicious that i kept eating until i could almost not walk! But we couldn't sleep because it was too hot; we had to take very cold showers in the wee hours of 2am in order to catch some sleep. And even after this, we couldn't cover ourselves. It seemed as though we were being baked in a low heat oven! The next day we started off for Jinja and i had to wear the lightest clothes possible. It felt strange driving on the "right side of the road" again. However, everything seemed strange. From the dust, to crazy traffic, to meat hanging in the Butchers; everything seemed strange. It dawned on me that slowly and surely, the American life was starting to take its toll on me; my body (without my knowledge) was adjusting to the cold and the comfort there. I was getting used to everything being organized and now here, everyone has to look through their shoulders and be alert all the time because the unexpected always suddenly happen. My wife had to adjust driving in these roads and on a few instances, we had some little scary moments. Somehow, as i thought everything through, i came to appreciate and realize that as Christians, we called into this kind of life; a life of looking though your shoulders and being alert at all times, lest you will drift away and be left behind. Sometimes we need comfort, but we also need these kind of reality checks, moments like these keep us alive and awake all the time to keep praying and be thankful. The drive to Jinja was one of the strangest days i have ever felt. Young people taking every opportunity to sell something to you in slow traffic, to someone knocking on your car window begging for alms was touching. I did not want to eat anything until we arrived at our new house in Jinja; our home. Our teammates and "parents" had also just made it back from the States and Australia a bout 5 days before we arrived and so, they had done a lot of work preparing the place for us. We made it to a very happy welcome. The hugs were longer and the smiles affectionate. The beds were all ready and the house looked great (hopefully we will be able to furnish you with some pictures once we get everything organized and in place). It felt so good to be in our own house! This is the first time we are living just the two of us in our house since we got married. We have always had people living with us and we hope to keep it this way for sometime so that we can enjoy each other more than before. Of course we welcome short term visitors. And the privacy did help with the heat in that we have had to sometimes barely had clothes on while in our house just to stay cool a little bit from the 100 degrees heat. Imagine transitioning from below 30 to 100 and above degree whether! Unpacking and organizing the house isn't an easy task. Beckie has been doing most of the arranging of things in places she wants them to be (i am not good at this) and slowly, we are almost there. Our team mates have been a very huge blessing to us, in fact we don't know how we could have been without them. We have been out for dinner a few times already and we all agree that we missed this place and are happy to be back. Tomorrow we have a class of about 36 rural pastors and church leaders and we have been busy putting things up and organizing for these guys. Buying food, setting the classes and dormitories, preparing training manuals, etc. And this week, i will be teaching two classes and i could do with your prayers for wisdom and ability to do a good job, that i will teach exactly what Father wants me to pass on to His beloved children. Beckie is busy helping with organizing stuff and shopping and helping with some administrative duties. We still feel a little bit jet lagged and are in need of His freshness and grace to accomplish the task ahead. Hopefully on Saturday after classes, we will head to Soroti to see and do some ministry there as well as see some members of our family there. One thing i have enjoyed since coming back is being able to have longer conversations. People are always available to talk longer, even though sometimes this is at a big cost. And oh, telephone calls are not that cheap, you have to pay by the minutes you use. I particularly had a very long conversation on phone with my former Pastor (he is the only person who can make laugh until my ribs pain and usually my wife knows straight away that it's him i am talking to). The first 5-10 minutes were just laughing sessions and then the next 20-30 were laughing and talking! He is a great man of God and i look forward to seeing him next week. Now we have to plan our phone calls carefully, otherwise, we could easily end up incurring huge expenses on calls since everyone is eager to talk to us and they usually just hijack our calls and turn them into theirs. Going to church on Sunday seemed strange too after being away from the routine for 5 months. We had to adjust to 30 minutes of standing prayer sessions and 30 more of praise and worship. It was good to see that our small church in Jinja was growing with a few new faces including a new Pastor. (The old one was transferred) and the current Pastor comes from Soroti. In fact his parents and sister were members of my Fellowship Group in Soroti. It was good to see old friends and we cant't wait for the scenes that await us in Soroti next week! Finally, i think it's a good thing to visit other cultures, to step out of your comfort zone and venture out, there are lots of things to learn and lots of things to appreciate. I am happy i got the opportunity to go to the States. Now, i look at my own country with new eyes, i see opportunities more than obstacles and i hope, i can help a few people to change their mindset and appreciate this country more and not to want to run away from it. Keep us in your prayers, we will share the pictures with you soon once we get everything organized. We love you, God bless you. America: An African Boy's Final Perspective. Thanks for making it to this final perspective and well done if you have followed all my perspectives! I hope you have had a good read as i have enjoyed hearing compliments from different people regarding what i wrote. I have thought long and hard about this final perspective and i hope i can be able to put all my thoughts together in the following lines. I guess i will start with some of the places/ events/ things that i have enjoyed most while here and they are in no particular order. I must confess that this country is more beautiful than i thought! I enjoyed the New England area so much, watching for the first time in my life the beauty of different trees bearing different colors was just amazing. Off we headed to the west coast and had a great time at the Grand Canyon! This beautiful place just kept reminding me of the awesomeness of beautiful savior! I kept watching with awe the beauty of this place and i never wanted to blink even for just a second because i wanted to take in as much as i could see in the shortest time possible because there was just too much to see. From nature to spirituality, Bethel Church was an amazing place. I very much enjoyed being in their soaking auditorium swimming in the presence of God worshiping the risen Christ. I loved everything; the freedom and diversity as well as creativity in worship. Indeed it is a soaking place and i would recommend this place for all true worshipers. Speaking to an attentive African American Students audience truly touched me. Watching them cry, laugh and smile as i shared my story with them was encouraging and reading their testimonies later was even more touching. It was good to know that some of them were struggling with the same things i struggled with at one point in my life and to hear and read them saying just like i did, they would never give up but instead strive on! 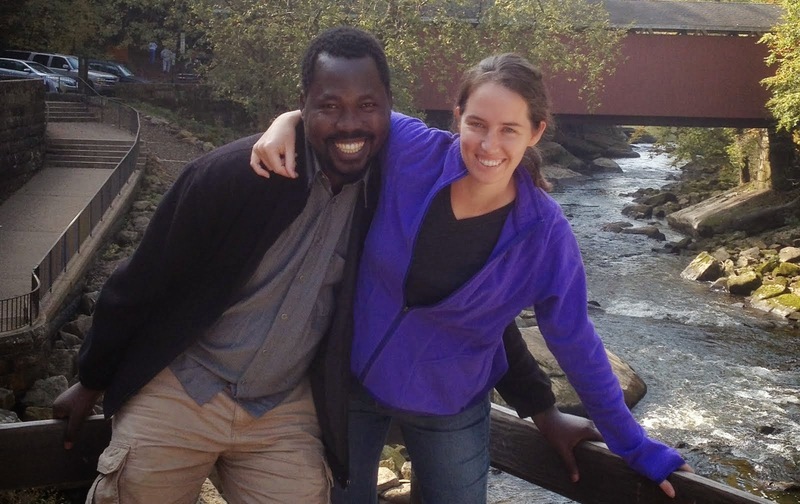 Who knew an African boy's story would inspire an American boy and girl? Only God knew! Watching the snow fall down for the first time was fascinating. With no previous personal experience wit it, i didn't know what to expect, even though i had read a lot about it both positive and negative. My own conclusion is that snow is pretty when you are watching it from inside than outside. I met someone who loves everything about snow; he told us he loves shoveling it, playing in it, watching it, everything. I wouldn't say the same thing about it (yet). Having traveled to/though more than 20 States, i got the privilege of having favorites and although i must say each State is unique in it's own way, if i had to choose where i wanted to live in future, i would go in this order: Florida, California, New Mexico, Arizona...i guess you must have already figured out why. I enjoyed the sunshine in Florida and the warmth of the people there as well as the sea food, California is beautiful and i enjoyed their 13 lane free ways (especially when there was less traffic and we could drive fast with our windows down and fresh air coming in), Arizona and New Mexico are areas i would want to do ministry in because i saw some things that were similar to what we have in Africa. The first place i felt comfortable at when i first came was the small Sunday evening prayer group. I went in there for the first time and at the end of the prayer meeting i felt i knew everyone there for decades! We were spiritually joined straight away and it became one thing i always looked forward to every week. It's beautiful that people who go to different churches can come together in prayer for the nations and the peoples and be in such strong spiritual oneness. To be sincere, i will miss this group so much because we all grew to know each other very well. I have enjoyed some of the foods here; pizza here tastes better, i fell in love with steaks and sea foods and after a few hesitations (because of the name), i tried new soda called Root Beer though i know this will cause a few raised eyebrows back home. I have also enjoyed cookies made by my grandmas here as well as mother-in-law, i fell in love with apple pie and apple crisp, i enjoyed burgers too and my favorite being coulvers (not sure whether i spelt the name right) and also beef/pork roast. There have also been things here that have left me chuckling and laughing. These crazy and funny things seem to only happen here in America and i can't wait to see the reaction on the faces of the people back in Uganda when i share these with them. Some of them are here: I doubt there's any other country in the face of the earth where people love their animals and pets more than America. Through our travels, we have heard and seen many things. We were told by someone how their mother loves her dogs more than her own children, we were told of a dog that sees a chiropractor quite often and has to be seen very early in the mornings before other human clients came in! It's ok to love animals, i had two dogs myself for hunting growing up and we have a beautiful dog in Soroti right now (in fact i had to shop for her a few playing dolls yesterday). My only problem is when people over do it and replace people with the animals and pets. My own belief is that nothing on the face of the earth should take the place for a human being because of the magnitude of the price someone had to pay for humanity! Aside from pets, i have always laughed hard each time i hear someone misuse a verb or tense. We have always held it that English speaking people don't make mistakes because it's their own language and most of them have not had the influence of other languages (Uganda has over 53 languages and dialects). I have heard people use past tenses in place of past participles or present continuous tenses for example i heard someone say: "I have drove there several times...". I am sure this is going make many young people laugh back home when i tell them that even English people make such mistakes; we are not alone. Another crazy thing is how people drink their drinks with ice in them even when the weather is freezing! I do like ice but i had never thought that people would put it in their drinks even during freezing weather conditions. I have also seen that most people here consider themselves to be right in what they think or hold or know. I don't know how to put it rightly but that's at least how i feel. In general, i enjoyed my time in America, i had a lot to learn and also a lot to be thankful for. It's different than watching it on TV, i must say Hollywood is not a real representation of America the way most people outside America think it is and i am grateful i got the opportunity to come visit and see it first hand. Tomorrow we depart for Uganda and i will carry with me memories; both positive and negative and hope to use this to create a positive and lasting impact in the lives of those in my sphere of influence. I have learned a lot that i hope to share with young people in my country. Also, as i read the booklet i was given to read about American history in preparation for my citizenship interview, i have learned a lot of great things about this country that seem to be completely different from what is happening now. The founders indeed had a greater vision for this country and i would recommend that every parent gets a copy of this booklet not just for their children but for themselves too. I was surprised that a high schools student didn't know the name of the American national anthem, didn't know how many stars are in the flag and how many stripes are in the flag! Reading this booklet motivates me even the more to want to complete the process and become a citizen of this great country. (Keep praying for me in this regard). I must also own up every word or sentence that has appeared in all my perspectives. None of my previous perspectives has changed and everything that i wrote before is still the way i first saw it or them for the very first time. I know some articles have been more critical than others and i am sorry if i stepped on your toes, but you must know that i am a free and honest thinker and i like saying things the way they are and express my thoughts the way i feel and my different perspectives have mirrored these. The next time you read from me, i will be writing from Uganda and i can't wait for my own experience in my own country after being away for the longest time ever, i will let you know of my culture shock in my own country if there will be any. Thank you so much for your love and support; you make us fight with confidence knowing we've got our backs covered. It was a pleasure to meet all of you and i hope to see you all again soon, if not in this life, then in the one to come. Grace and peace be multiplied to you through the knowledge of our Lord and savior Jesus Christ and God the Father. Amen. America: An African Boy's Perspective 16. So, as most of you know by now; we are heading out back to Uganda next week on Tuesday and we are all very excited to go back! I am forever grateful to God for the opportunity to come to the States, it has been a huge privilege for me, one that i don't take lightly and one that has given me many memories that i hope to one day with my children. I have been encouraged each time we have met someone who said they had been reading my posts; i never knew in the beginning that this was going to be something that many people would be interested in and something they would look forward to reading each week. The winter hasn't been as brutal as first feared and i am proud of myself for trying to enjoy it, even though this has come after numerous fears and worries. Now i can say i shoveled the snow, i played in it, and watched it from the comfort of a warm living room! As i prepare to go back to mother Africa, i have been recollecting and thinking about some of the things that stood out from my time in the States; some positive, and some negative. I know every single country under the earth surely has its pros and cons as well. Two weeks ago, i, my wife and my mom in-law flew to Florida for some warm weather as well as seeing the grand parents; a trip that i enjoyed and one of the highlights of my time here. I was amazed that even though it was snowing here in Grand Rapids and there was no sunshine, as soon as we went up beyond the clouds, the sun was shining and seemed to be very hot! This was fascinating to me; because it had never occurred to me that the sun never stops shining no matter the weather conditions in the earth–indeed God is amazing! I liked everything about Florida: the weather was perfect, the people in the park where our grand parents live are a great community–everyone greets each other, they have games and competitions, they have friends (our grampa told me they have made more friends since moving there than they have ever made in their entire lives!) and they have parties too! (we attended a Michigan dinner there and oh boy, it was marvelous. Seeing these old folks dressed like in the 50s and 60s and seeing them dance to the tunes of their times was spectacular! In fact we got so motivated that we had to join the dancing for a couple of songs, something that i have seldom done before). I was taught new games such as Bingo, Hand and foot, among others and was on the winning side a couple of times! In short, i loved my time in Florida and could live there if i had to because i love the company of old people; i always learn a thing or two from old people and that's why i love being around them. One of the things that i have learned from here is honesty and integrity. We have met some people that you can sense and see that they are honest; this is an area that is somewhat not common in Uganda. I think because of the different tragedies that people went through, honesty got left behind as people started telling lies in order to get something or avoid something. I am planning to go back and put more emphasis on honesty and integrity among the young people that we minister to. Of course i know, reading from the social media that there are also dishonest people here, but i haven't met any of them so far, which, if it was in Uganda, would have been a miracle! I have enjoyed my time in the different churches that we have gone to. I must say the word is alive and i personally received a word for my self in all the churches that i have been to. I have been blessed, encouraged and rebuked. But there's something that we have in Uganda that is missing here just like the church here has something that is missing in the church in Uganda. I could say that the church here is like wood that is lacking a fire to spark it off and the one in Uganda has a fire but lacking wood. By this, i mean that there's more encounters with God in Uganda than here, you hear more of people's encounters with Him and you can see and sense the workings of the holy spirit in the glow in their eyes when they talk about it; there's a spark in their eyes and excitement and you can see it in the way they worship and dance and jump and ululate, while here, people know more about the word, and i would say it seems to me like they have become more familiar with it that there's rarely excitement about it and rejoicing about it, at least that's how i feel. My biggest worry though is that in 10–30 years time, it may become harder to pastor people here because they will be even more knowledgeable and trusting in what they already know that they will feel it's a waste of time sitting there listening to someone say what they already know. Sermons will become more of debating topics for the people because everyone feels they know enough and their way is always the right way. Of course there's no doubting that the whole church needs a revival and that revival must start from the States because of the influence of the church here to the rest of the world. People look up to America for almost everything and that's why the revival must start from here. However, one time as i was praying, the Lord told me the church in China is alive and making progress and it's a matter of time before it becomes the most influential church in the Universe. This is because the persecuted Church is living and depending more on God; He is their banner, their rescuer, their provider, their refuge and they know Him in a deeper level than most of us do. That's why they are willing to die for Him! I have been wondering recently what my reaction would be if i had to choose between death for believing in Christ or denying my identity in Him and live. What do you think would be your immediate reaction? I admire those who practice Christianity in countries where it is illegal to do so and my desire is to one day experience what it feels like to worship with these brothers and sisters. One thing that separates America from the rest of the world is the generosity of its people! We have been and continue to be blessed beneficiaries of this generosity and i think that's why people here have so much, because they also give out so much. I know in my church, this is one thing that distinguishes us from many churches; giving. It's a principle that i have learned in a hard way and one that i have reaped it's benefits and hope to pass on to my own children in future. It amazes me that children here are taught about giving from the young age, while our children learn more about how to receive and beg from the young age! in fact children in our home church here (Remembrance) always collect their offerings to support the work in Uganda and at the end of last year, they gave us money enough to buy a bunk bed in Uganda! If i had one thing to tell the people here, it would be to never stop giving and never stop teaching your children about giving because it is what sets you aside from the rest of the world! I will continue from here next week with my final piece on this series before we head home; till then, remain blessed in Him.